Would you rather buy something unpersonal that a machine made, something that there are hundreds of, or something plotted, created and crafted by skilled, passionate, creative and one of a kind hands that have a life and story behind? I LOVE to see Broadway musicals! We have an amazing outdoor theater in KCMO that I go to every summer to see them. The King and I and Beauty and the Beast where both breathtaking! When you're afraid to do something do it ASAP! The longer you wait the scarier it gets. In a round about way my mom did, by buying a small beading kit at a yard sale. But my artsy and crafty-ness goes back a long way. My parents knew I had some artsy-ness in me when I only drew tiny circles when I was a baby. And when I got older I make leather saddles and bridles for all my Breyer model horses. Even dog collars for my Barbies dogs complete with little wire 'spikes'. 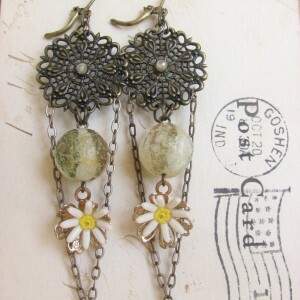 I'm inspired to make new jewelry designs by so many different things it's hard to just name a few! I love Art Deco and Art Nouveau styles, though I don't use them in my own pieces much. 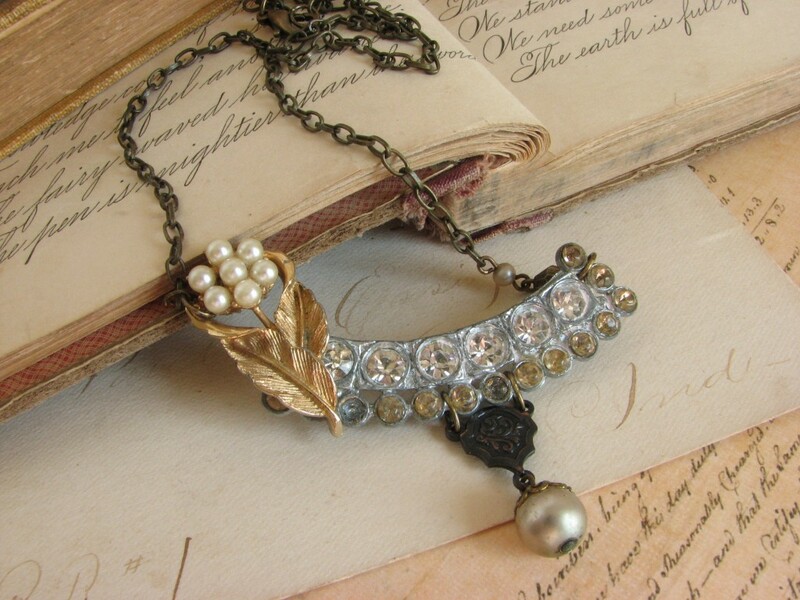 Just finding juicy vintage goodies to repurpose can inspired a new piece. 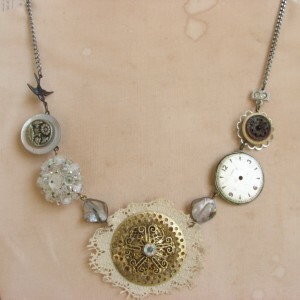 My 'Bits-and-Bobs' statement assemblage necklace is very popular at the boutique in Florida, Pheeney's. 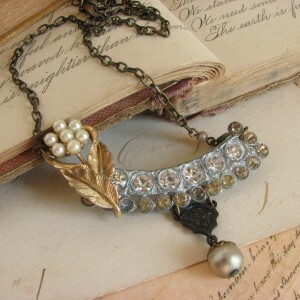 I think the inspiration cake from the beautiful vintage lace flower I use for the center piece of the necklace. After that I have no idea where the rest of the necklace came from, I'm rather sporadic when I'm at my design desk, I might start out with one design and it suddenly evolves into something entirely different! 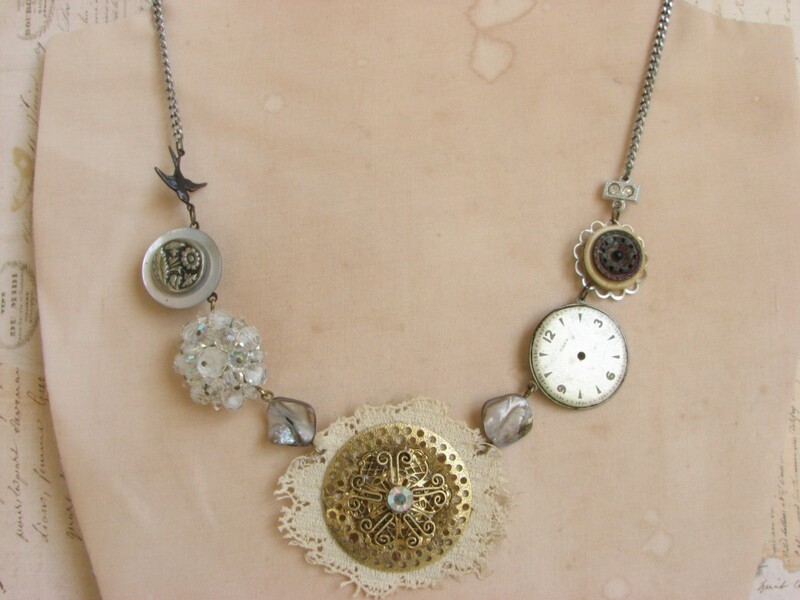 Each one is different, the overall design stays the same but they're one of a kind necklaces, make from vintage and antique buttons, rhinestone necklace clasps, lace, earrings, watch faces, brooches, beads etc. so they all look different and beautiful in they're own way. Every time I make a new one it's my new favorite! I found some vintage Red Cross button covers I'm planning to use in a Bits-and-Bobs necklace that will be sort of a 'super chic nurse vs. french country' style necklace with chandelier crystals and a beautiful faceted red vintage bead I only have one of. I first started selling custom pieces to friends and family and then discovered Etsy, the most amazing place for artist and crafters! The people on there are the best, I'm always running into the kindest individuals. There a great sense of community. 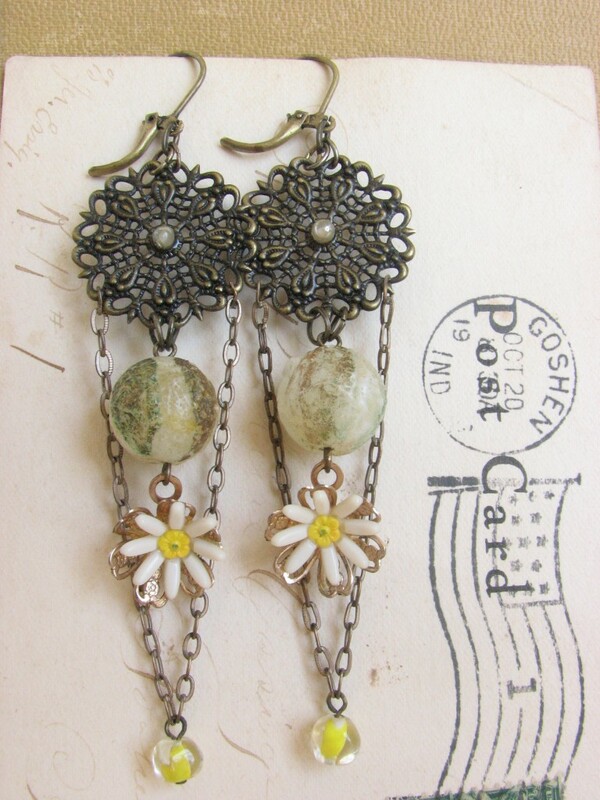 I also sell some of my jewelry at a boutique in Florida called Pheeney's on Medeira Beach. I also love to crochet and sew clothes and there's something so rewarding about wearing or using something that you made with your own hands, that you put time, effort and concentration into to create. That's why I appreciate and support handmade, homemade, homegrown and locally owned. A tiny, (and cute), Kansas country town.